I left two of my oldest quilt tops with a friend last night to be delivered to the long arm quilter. I have seen the work of the lady who will be quilting my beloved tops and I am very excited to see how she quilts these tops. I am also very excited to have these quilts moved out of and off of the UFO pile. I am very proud of the workmanship on both of these quilt tops. They are very different quilts. The Dresden Plate quilt was machine pieced and both machine and hand appliqued. As I have mentioned in previous posts I started this back in the 90’s. The top has been completed for a long time – I just wanted to have the right person quilt it for me. 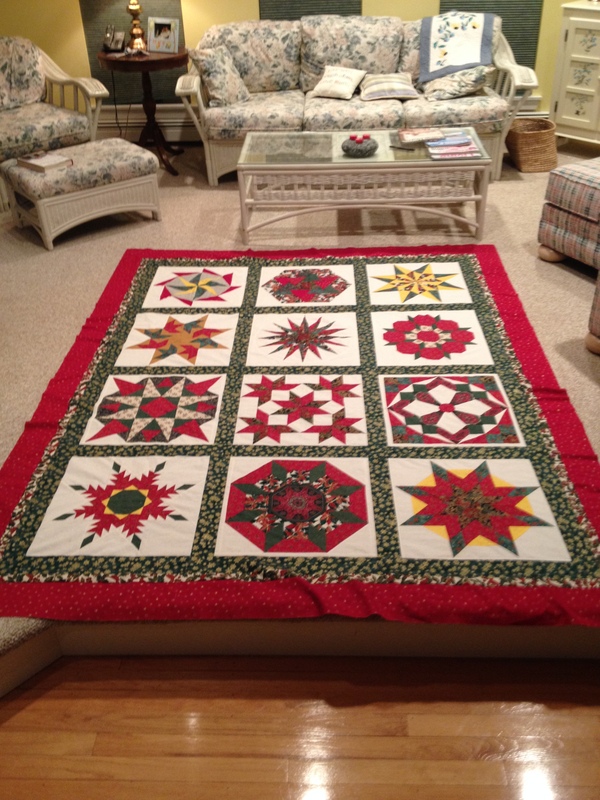 The Christmas Stars quilt was a block of the month class taken many years ago at Log Cabin Fabrics in Selkirk, NY http://logcabinfabrics.com/. If you are ever in the Albany, NY area and can stop in it is worth the visit. The ladies ( Londa, Lisa and Bonnie) will take very good care of you. The fabrics for both of these quilts were purchased many years ago at this shop. I hand pieced most of these blocks, I added the sashing and borders using my machine. 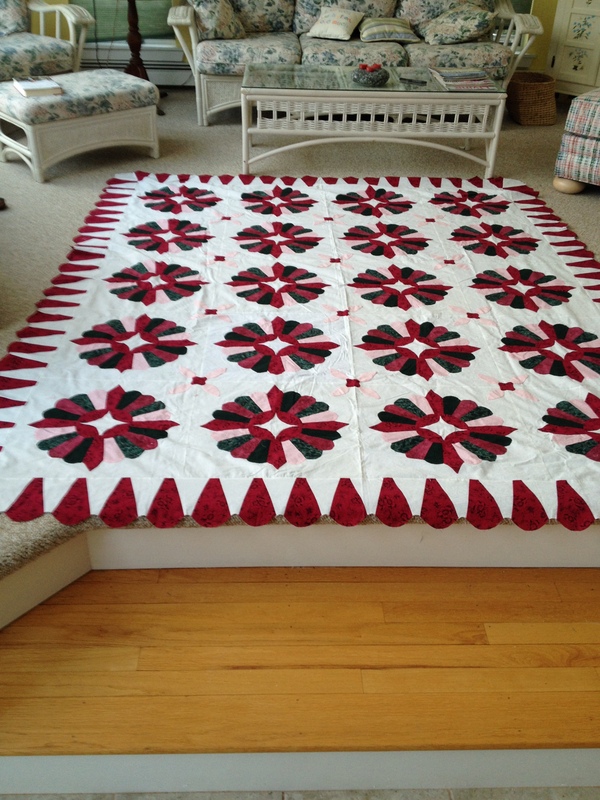 The quilt shown in the picture is not the completed top, I added one more border using the same fabric as the sashing. 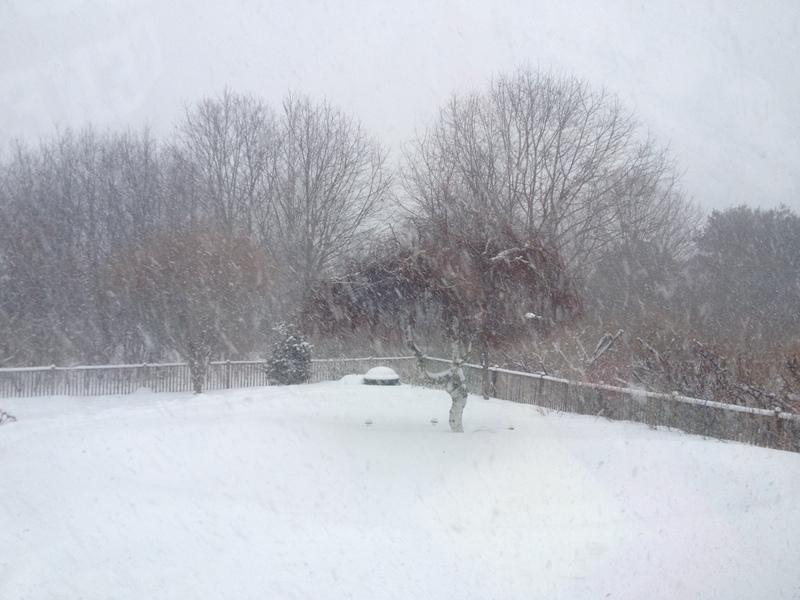 We had a snow day on Wednesday. I made a wonderful Chicken Pot Pie for dinner and settled in to work on quilts that night. The best thing about snowstorms is that it is a perfect time to work on quilts. When the world looks white it is fun to pull out a pile of fun fabrics to brighten your day. I also have been working on blocks for a block swap but I can’t post any pictures of those yet. All I can say about them is that the background is white and the main fabric was supposed to make us think of summer. When the weather is cold and snowy it is nice to think about summer, sunshine and warm air. Now back to my Bonnie Hunter mystery quilt – Celtic Solstice. I have 40 blocks done and a gazillion more to sew. I will post pictures of that soon. ← The problem with UFO’s is…..
Oh mY Goodness you NEVER cease to amaze me Faith! Thank you – I started both of these while I still lived in Westerlo and we both know how long it has been since I was there. I will be so happy to finally have them in the completed pile. I may even enter them in the Maine Quilt show this year.